One advantage of hanging your flatscreen on the wall is the appearance it gives of floating in space. The same goes for this great-looking TV stand from Alphason. If hanging a flatscreen and sealing any obtrusive cables inside the wall sounds like too much like hard work, then a much easier option is to pick up a TV stand. The problem is, some TV stands can be rather ugly and not only detract from the screen itself, but are bulky and take up space. Not so with the great-looking Aspect, as it's made almost entirely of glass. When you place a silver surround flatscreen and silver coloured kit on the two spacious shelves below, the stand almost disappears, making your screen appear to float in mid-air. But just because the sides and shelves are made of glass doesn't mean that the stand is lightweight or flimsy in construction. 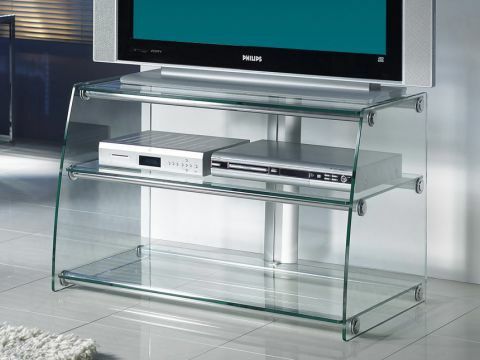 Its transparent, highly-polished 8mm thick shelves are made from toughened glass that's capable of withstanding the weight of a 42in TV (although the 930mm width means that the Aspect is more suitable for 37in screens). This width is also just right for placing kit (such as a DVD player and amplifier) side by side. What's more, with two shelves (non-adjustable) there's also ample room for the satellite receiver and centre speaker. The glass shelves are supported by polished chrome rods and any unsightly wires can be routed through a cable tidy column at the back of the stand. Constructing the Aspect is very easy with an illustrated instructions manual similar to the literature that accompanies flatpack furniture from IKEA. Just make sure you've decided where to place your stand before setting it up as the Aspect has no wheels, so moving it around is not an option.